To help the sport of rodeo grow it’s vital that we educate our next generation rodeo fan. I graduated with an Elementary School Teacher Degree and have been educating the youth for 28 years. I am a past WPRA World Champion and a multiple collegiate rodeo champion. Cowboys & Kids Rodeo Booklet was introduced a few years back and it’s proving to be a great tool for a rodeo committee and schools. 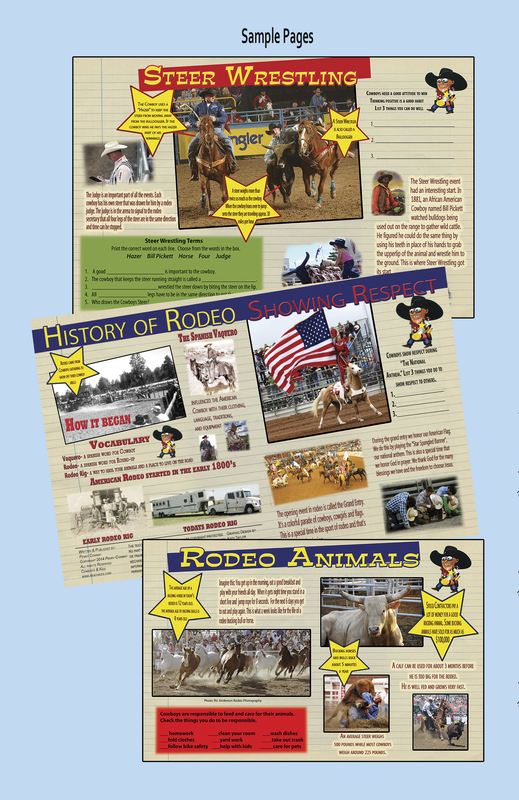 Cowboys & Kids Rodeo Booklet is a colorful 20 page publication highlighting each rodeo event with several written activities dealing with rodeo lingo and positive moral issues. The Cowboys & Kids Rodeo Booklet has gone to approx. 100,000 children & adults in multiple rodeos and schools. The teachers are loving the additional curriculum of highlighting the American Cowboy and Rodeo that teaches over 130 curriculum points. It’s been a Win-Win opportunity to help educate the public and help a rodeo committee advertise their rodeo event and promote their sponsors through their own 4 pages of ads in the booklet.